As you may already know, Apple is expected to introduce three new smartphones at a special event taking place at some point in September. Aside from the new iPhone 8 (with a near-bezelless OLED screen), the company will also unveil the iPhone 7s and 7s Plus. These are to be similar to their predecessors in looks, but come with glass backs instead of aluminum (and no antenna bands in sight). That will make them (and the iPhone 8) capable of wireless charging, a first for Apple's mobile portfolio. Now a new report claims that the iPhone 7s will be slightly thicker than the iPhone 7 because of the use of glass on its back. In fact, as the leaked schematic below shows, it will be bigger than the 7 in all dimensions. 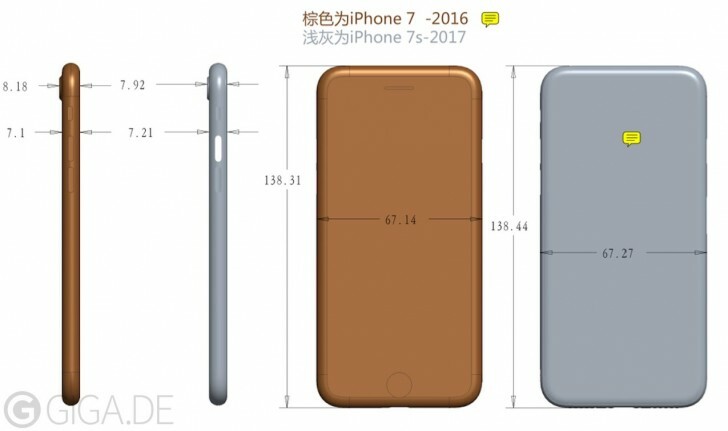 Whereas the iPhone 7 measured exactly 138.31 x 67.14 x 7.1 mm, the iPhone 7s will be 138.44 x 67.27 x 7.21 mm. Of course the increases are all incredibly small, and you're likely not to perceive them in day-to-day use. Yet if you have a tight-fitting case for your iPhone 7 and wish to use it for its successor, that may not be possible. Interestingly, while the iPhone 7s will be thicker than the iPhone 7 throughout, this situation will be reversed for the camera bulge. The iPhone 7 is 8.18mm thick where the camera hump is, but the iPhone 7s will only go to 7.92mm. When you combine this with the fact that the new model will be thicker elsewhere, you get a smaller actual camera bump for the iPhone 7s relative to the rest of its body - just 0.71mm, compared to 1.08mm on the iPhone 7. So it's as they say - you win some, you lose some.